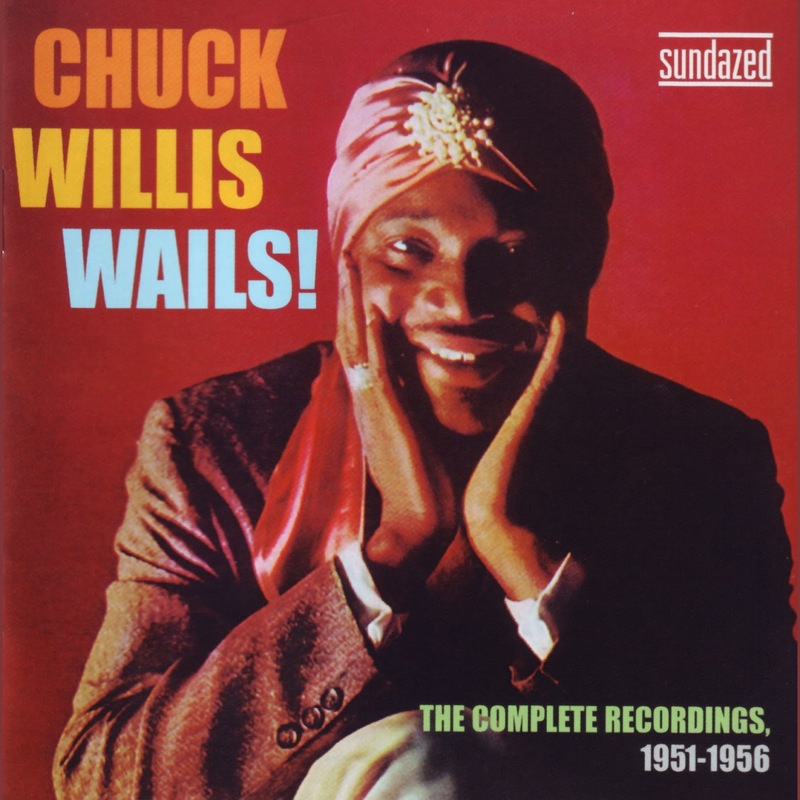 Chuck Willis, aka "The King of the Stroll", originally recorded "Feel So Bad" in the early 1950s as a pretty (great) standard R&B tune, with rolling piano and horns. 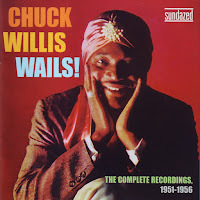 The structure of every future version is all there - the stops and starts, the lulls and crescendos - but the arrangement isn't too far from other R&B fare from the late-40s and early 50 (or Willis' other big hit, "C.C. Rider"). As far as I can tell, the song didn't get much more attention after the birth of rock & roll in the mid-1950s. Chuck Berry's guitar, Little Richard's piano, and Elvis's hips quickly left the horns & piano of Chuck Willis in their dust. By the early 1960s, Rock & Roll had been mostly tamed - girl groups like the Shirelles and crooners like Dion had momentarily eclipsed greaser guitarists and bar room piano players at the top of the charts. Elvis, of all people, upon returning from the service to find a very different musical landscape and trying to fit within it, recorded a pretty straight forward, unremarkable cover of "Feel So Bad". It was a minor hit and resurrected the forgotten song, but it still isn't the funky blues tune most know today. At the same time, blues musicians of the day playing juke joints and clubs, put the funky spin on "Feel So Bad" that has since defined the song. Little Milton and Otis Rush both recorded bluesier versions of "Feel So Bad", making it a bit of a standard. In the decades since, everyone from Gregg Allman, Bobby Blue Bland & BB King, The Derek Trucks Band, Gov't Mule, Foghat, among a litany of others have added "Feel So Bad" to their stable of "go to" tunes. 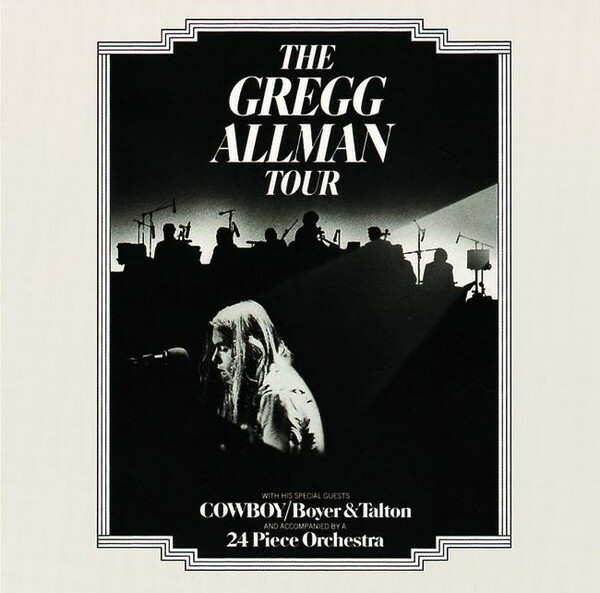 I first heard "Feel So Bad" on The Gregg Allman Tour. I had the double live album on vinyl since it wasn't available on CD until the early 2000s or so. Gregg Allman rearranged the song quite a bit, as he often did, creating a funky interplay between the horns and guitar, and a call and response between himself and his backup singers. Most other versions use the Little Milton version as a blue print, which is probably my favorite version and mostly inspired mine. I also tried to add some of the funkiness of the BB King & Bobby Blue Bland Together Again version, which is bunch of funky fun from two old pros. Naturally, The Derek Trucks Band covered the tune, with Derek playing the hell out of it, bring the song down low and up high like no other. I wanted to dirty up "Feel So Bad" which made me focus on my tricone rather than the earthier wooden dobro. The song is deceptively simple - I spent a lot more time putting this track together than others, mostly the getting the solos interplay just right. I really wanted to leave space and let the song breathe unlike the wall of resonator sound that I've laid on other recordings. I really got to know my tricone better as I spent time crafting the instrumental highs and lows and call and responses, which is difficult to do on ones own without losing a sense of spontaneity. Since I put the song in the key of E, it left me with less room on the neck of my tricone to play on, which I kept in D with a capo for open E. It was a good exercise, it was a challenge that definitely made me a better player. "A Day in the Life" may be the best pop song ever recorded, but "Flying" has been my favorite Beatles song for a long time. 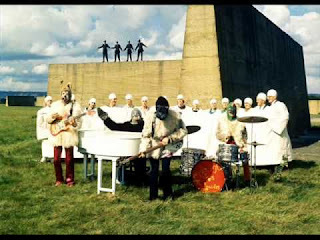 Many Beatles fans are not even aware of the brief instrumental sandwiched in the middle of 1967's Magical Mystery Tour, the band's slightly less-loved follow up to the legendary Sgt Pepper. Part continuation of Pepper, part soundtrack to a movie no one except Paul McCartney was interested in making (which directly lead to an animation studio fully producing the content for their final contracted film, Yellow Submarine) Magical Mystery Tour contains several classic Beatles cuts like "I am the Walrus", "Strawberry Fields", "Hello Goodbye", "All You Need is Love", but was never thought of as the complete thought that Sgt Pepper was since it was essentially an EP (in the UK) with some previously released singles used to pad it to a full album (in the US). It was well-received at the time, but has never really received the acclaim that Sgt Pepper, Abbey Road, Revolver, and Rubber Soul have because it is a bit of a patchwork of (great) ideas. The Beatles themselves didn't seem to know what to do with the song "Flying". In the years since the album was released several alternate versions have surfaced. Two of them are more common; the first is relatively similar to the final product, albeit looser and with some odd whistling effects. The second clocks in at 9 minutes, most of it being extended trippy noise similar to the outro. I wanted to expand the tune slightly, but without dragging it out - part of the song's charm is its brevity. I stretched it from 3 verses to 5, and brought the bass up an octave to add some warmth to the acoustic setting, though in doing so it lost a pit of the trance-inducing pulse. Since it is a relatively obscure Beatles tune, "Flying" hasn't been covered as much as, well, pretty much every other Beatles song. But it is still a Beatles tune, so there are a few oddball covers that have been released over the years. Beatles covers can be dicey, for every "With a Little Help From My Friends" by Joe Cocker or Wilson Pickett's "Hey Jude", there are 100 painful "Sgt Peppers Lonely Hearts Club Band" by the BeeGees or any whispy-voiced college girl with a guitar singing "Across the Universe". This is apparent on Julie Taymor's ambitious Across the Universe 2007 film, which features such failures as Eddie Izzard's rendition of "Benefit for Mr Kite". However, there is a gem of a cover from that film, The Secret Machines take on "Flying". They successfully stretched the song out, mostly using keyboards, expanding on the original while still adhering to what makes "Flying" a great song. It's a good blueprint for covering the Beatles - respect the original, make it your own, but don't take it too seriously. I suppose it is fitting that immediately after covering The Rolling Stones I'd pick a Beatles tune. It wasn't done on purpose, I have a couple of songs loosely put together at the moment, I only noticed after I'd posted them together. I'm not sure when "You've Got the Silver" became my favorite Rolling Stones song. 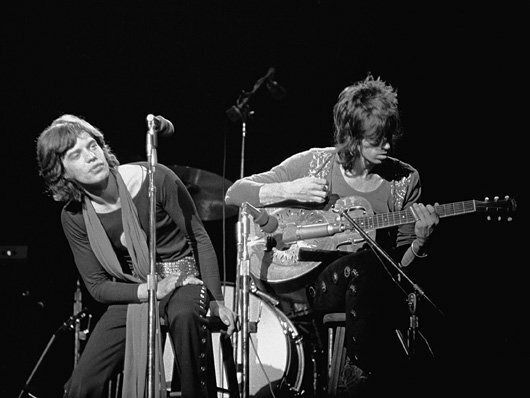 It must have slowly seeped into my brain after repeated spins of Let It Bleed, the Stones' 1969 album. There are some serious haymakers on Let It Bleed: "Gimme Shelter", "You Can't Always Get What You Want", "Love in Vain", "Monkey Man", just to name a few. There isn't a bad song on either album side. But "You've Got the Silver" stands out as unique - it's a quiet, front porch Keith Richards tune that largely avoids the Stones' signature chomping, bluesy guitar riffs. I thought such a sweet, melodic song would make a nice addition to part two of my acoustic project. Naturally, one of my other favorite artists, Susan Tedeschi, must have thought the same. I recently discovered that Susan covered "You've Got the Silver" in 2005 with some guitar help from her husband, Derek Trucks. Honestly, Derek and Susan must have my ipod or something. It's a great version, but I wanted to stick closer to my "wall of resonators" sound without losing fidelity and simplicity. It is a song that should never stray far from the porch. Now that I've completed a few tunes, including my first album of sorts, I thought I'd do a quick feature about the instruments that I'm using. After learning piano and moving on to alto and tenor saxophone, I started playing guitar sometime in middle school. I never thought I'd ever want to play guitar, but listening to the Allman Brothers piqued my interest. Electric guitar is easier to begin on since the string gauges are lighter and the neck is often smaller, so it was a year or two before I got an acoustic guitar. In fact, I got a Regal spider cone dobro before I got a standard acoustic guitar, having fallen in love with the sound of a dobro after repeated listens to The Duane Allman Anthology. Eventually I bought this Sovereign Harmony acoustic guitar for about $125. It sounded decent enough and the tobacco burst matched the Paul Reed Smith I had already swept floors for months to save up for. 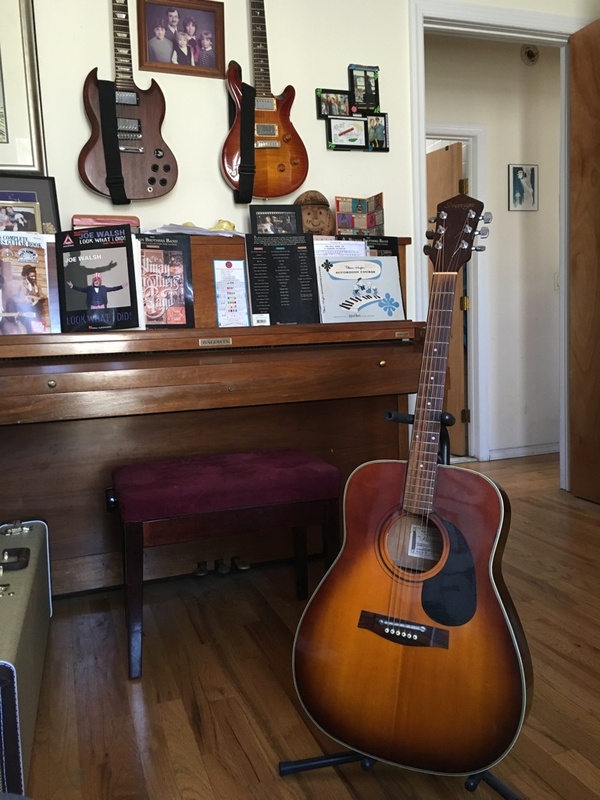 They were my only two guitars for about the next 20 years - I was pretty busy working, going to school, and just making enough to feed and house myself to think about playing and collecting more guitars. Having no easy way of inquiring about the history of the guitar in 1997, it was only recently that I looked up the model number to find out it was made in the mid-1980s. The guitar still sounds fine, though the bridge needs some work. 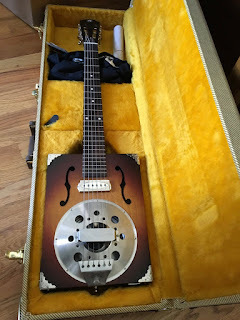 Prior to getting my recent resonators, I would keep the acoustic in open tuning for slide and finger-picking which meant I would also keep the action high. The bridge has since started to wear and split, so if I now lower the action, the strings buzz. Still, it has a relatively rich tone and resonance for a mid-range acoustic. That first Regal spider cone I bought didn't last long. The cone quickly loosened up and buzzed, it was pretty apparent it was junk, so I returned it towards a Marshall amp. It would be almost 20 years before I replaced that dobro with another Chinese-made dobro, a Recording King. Although it isn't quite as nice as a Beard, the Recording King has a wonderful tone for a mid-range dobro. I did a lot of research and eventually found this Recording King round neck at Elderly Instruments. It has a wonderfully rich, warm sound for a mid-range dobro, though I would love to find a dobro that joins the neck at the 14th fret rather than the 12th fret. It's amazing how much easier it is to research and shop for instruments in this day than it was in the mid-1990s. It would be unheard of to purchase an instrument that you had not played or at least heard, but today the internet allows you to sample audio and compare options that your local instrument dealer could not provide. Even living here in New York City, you never know what a high end or low end instrument dealer will have in stock. 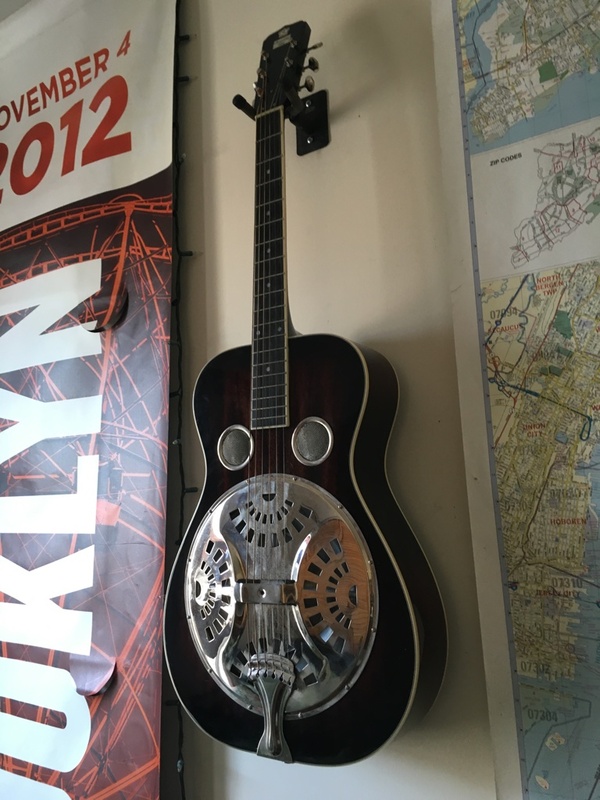 I was so happy to find this dobro at a steal of a price ($350 for a $550 retail) at Elderly Instruments. I had wanted a steel body guitar ever since I first saw a photo of one when I was in high school. 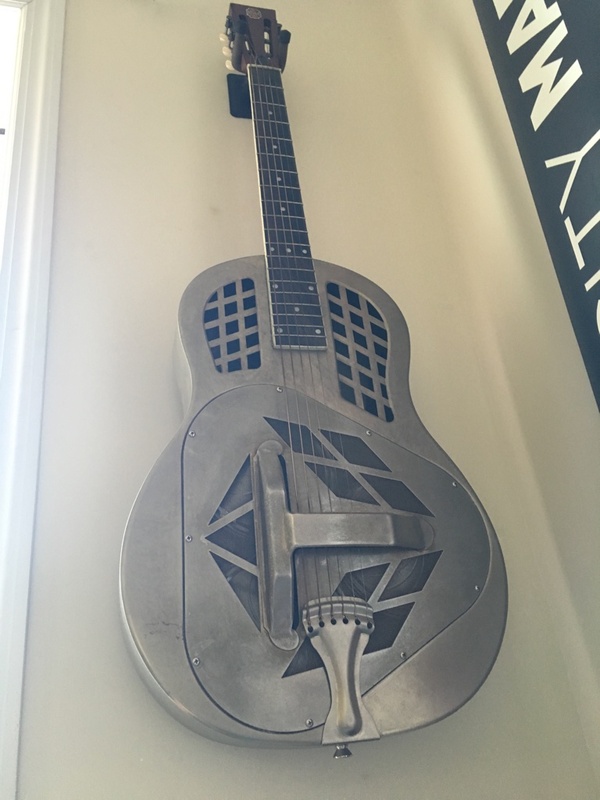 There was only one instrument store in Madison, WI, that carried anything close, so I never really got a chance to play a range of resonators. Therefor, I didn't really know the difference between a biscuit, tricone, or spider cone at the time, just that the art deco design of a tricone looked incredibly cool. Last year I began to research and fell in love with the tricone's sound. A biscuit cone is short and punchy, and a tricone is lush and steely. Sometimes you don't know what you want, even when you really do know. Even after trying out a few Nationals at an expensive guitar shop in Soho and deciding I wanted a tricone, I first ordered a Republic Highway 61 parlour biscuit cone as kind of an in between option. But it just wasn't right. I returned it, realizing that a tricone was what I really wanted. However, I didn't want the maintenance of a shiny brass finish, so I was really happy to see this weathered body finish available on Republic's website. Republic does not custom order finishes, so I quickly snatched it up, and it's pretty damned perfect for a mid-range tricone and compliments/contrasts the spider cone nicely. I bought a 3-string cigar box guitar about a year ago at Wanee Fest and really fell in love with their folk art qualities and simplicity. Why pay $4500 for a new National when you can build a guitar by hand out of found materials? It's a piece of art in its own right. 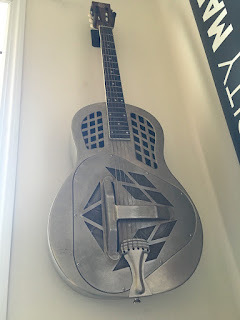 But, I had to take it further, and found Daddy Mojo custom instruments shop who happened to make a biscuit cone cigar box guitar with a custom pick-up. I fell in love with its sound (and it looks beautiful), and returning that Republic Biscuit cone months earlier made even more sense. 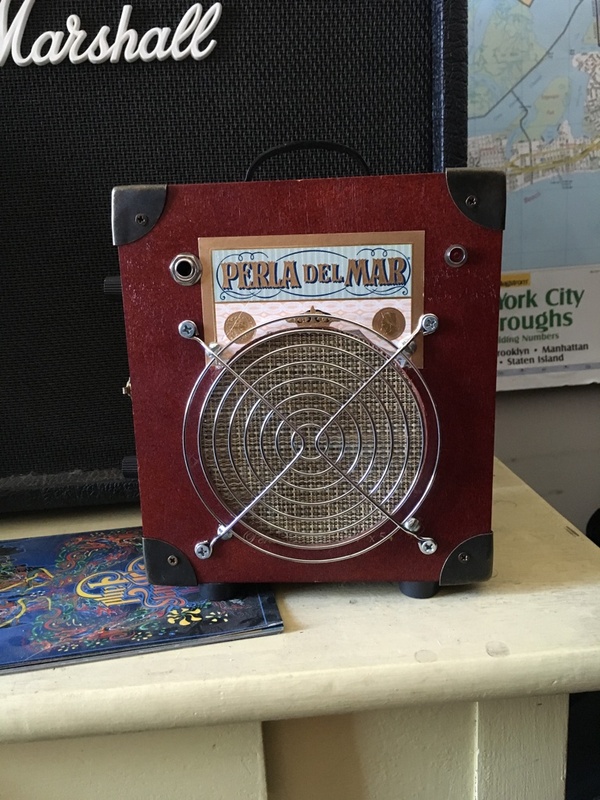 I pulled the trigger and a few months later I had an insanely amazing and unique cigar box resonator. It is plucky and dirty at the same time, like a piano with the damper pedal down. 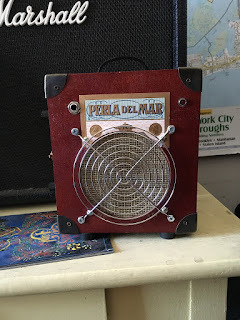 Of course, I needed a better cigar box guitar amp for it, so after months of searching I found Hip Kat amps and added one of their home-made 2.5w cigar box amps (the one I purchased at Wanee never worked quite well). This one has a wonderful range of tones and looks great.